If you wish to use our public REST API to integrate with Velpic, you will need an API Access Key to use in a header for authentication. To generate one, please follow these steps. First select the Integrations view on the left navigation of the Manage section. This will open up the integrations section in your main panel. The options you see may differ according to your subscription level. Click API Access Keys that and you will see this view. On your first visit, you will not have an API Key yet. Click on Generate API Key and the system will generate your first API Key. Keep this value secret, it is the value which authenticates your account when calling our REST api. If you wish to cycle it due to security concerns, etc, the click on the Regenerate API Key button. This will inactivate your current key and issue you a new one. Please keep in mind that this will break any integrations that you have written that are using the previous value. You can only have one active API Key at a time. Your access key is an alpha-numeric string that must be attached in the header of all requests as AccessKey. This key is secret and should be treated like a password. curl -X GET -H "AccessKey: [ACCESS_KEY]" -H "Content-Type: application/json" "https://app.velpic.com/api/v2/user/?roleId=3"
This should return a set of JSON objects, similar to the following. This will return a set of users who are Trainees. In your terminal, navigate to the folder you saved GetTrainees.js in and then enter the command. WebHook integration provides Velpic with a way of communicating real-time information to third-party applications using HTTP callbacks. WebHooks make HTTP POST requests to send data in real-time. This is advantageous over traditional API’s which require frequent polling, a process that can be less efficient. Messages are sent in JSON format. Once in the integrations page, you will see an input for the WebHook URI. This is the address that the event posts will be sent to. Enter your desired URI here. You will also see a dropdown for the types of events for which messages will be posted. A list of these events and their payloads can be found in the Events section below. After selecting your event type, click the add button. The WebHook setup is now complete. You can now add more WebHooks to your account. There is no limit to the number of WebHooks you can set up. WebHooks can be deleted from the WebHooks page. Simply click the trash icon beside the WebHook that you wish to delete. When a WebHook is deleted, it is inactivated and will not generate ay new posts. This event will trigger whenever any of the events in this section trigger. This event fires when a lesson schedule is changed. If a schedule assigned to multiple users is changed, the event will fire for each user. 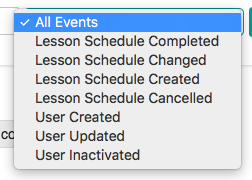 This event fires when a lesson schedule is created. If a schedule assigned to multiple users is created, the event will fire for each user. This event fires when a lesson schedule is cancelled. If a schedule assigned to multiple users is cancelled, the event will fire for each user. This event fires each time a user is created. This event fires whenever a user’s settings are changed. The user object contains all identifiying information about users within the platform. 7 OWNER There is only ever one owner. clientStatusId This is an id to indicate the users active status. Called to find users based on a number of criteria. You can search for users by any of the paramaters. Specifying no paramaters will return users in a paged set. AccessKey: "Your API Access Key"
"description": "The list of users in a UserBasic object structure." "description": "The total number of results in the search"
"description": "The start index of the result set"
"description": "The end index of the result set"
"description": "A description of the error"
"description": "The reason for the error"
"description": "The internal status code of the error"
"description": "The error for the message"
"error": "You are not authorised to make this request"
(Optional) A string to query that matches to username, firstname or lastname of the user. (Optional) A exact match to the email address for the user. If no match, then no user will be returned. "description": "The users email address"
"description": "Phone number for the user"
"description": "Mobile phone number for the user"
"description": "The active status Id for the user"
"description": "The groups the user is a part of"
"description": "The groups a user supervises"
"description": "The roles for the user." "description": "the timezone for a user"
"description": "The date the group was created"
clientStatusId An id that indicates the users active status. roles Indicates the access level of the user. "description": "(Optional) a username to set for the new user. This will be automatically generated if none is supplied"
"description": "Firstname of the user"
"description": "Lastname of the user"
"description": "Email of the user"
"description": "The phone number for the user"
"description": "The mobile phone number for the user"
"description": "The clients employee number for the user"
"description": "(Optional) Set to configure user creation to send the welcome email. Is true by default." "description": "(Optional) The plaintext password for the user"
"description": "(Optional) The roles to set for a user. By default users are created with the TRAINEE(6) role." "description": "(Optional) the timezone for a user. If not set, the timezone will default to the timezone set for the client"
"description": "Unique identifier for the user"
"description": "The date the user was created"
"description": "The date the user was last modified"
Call to create a user within Velpic for your organisation. Call to update a user within Velpic for your organisation. "description": "Employee Number (can be null when not used by company)"
"description": "The password for the user"
"description": "Field to use as identifier to update an existing user"
mergeType can be used to identify if you’d like users to be merged based on a field. This response has no content. Create a magic link url that provides automatic, username and password free account login when clicked. APIs that allow for read and write of Groups. A Velpic group contains members and supervisors. Supervisors have the ability to perform manage functions on users in the group and view followup information. Automatic scheduling rules can be set for members of a group. "description": "The result of groups." The starting index to list from in the result set. "description": "The name of the group"
"description": "The id of the parent group"
"description": "The number of members in the group"
"description": "The related client Id"
"description": "a list of the members in the group"
"description": "Meta data information about the seach"
"description": "List of users ids to be added as group supervisors"
"description": "Description of the error"
"description": "Reason for the error"
"description": "internal velpic code for the error"
"description": "The http code for the error"
"description": "List of users ids to be removed"
"description": "a list of the supervisors in the group"
"description": "List of users ids to be added to the group"
"description": "List of supervisor users ids to be removed"
The unique identifier for the group. A Lesson is the learning content that can be scheduled for a trainee. inactive A lesson that was previously published, but inactivated. Cannot be scheduled. never A lesson that is being edited and never been published. Cannot be scheduled. rendering A lesson that is currently rendering. Cannot be scheduled. error A lesson that has errored during rendering. Cannot be scheduled. "description": "The list of lessons"
scheduled Lessons that are scheduled for the future but not available for completion yet. "description": "The scheduled start date of the lesson"
"description": "The due date of the lesson"
"description": "The active flag of the lesson"
"description": "The UserId of the trainee assigned the lesson"
"description": "The ID of the client the trainee is part of"
"description": "The name of the client the trainee is part of"
"description": "the unique lesson version ID"
"description": "The unique lesson ID"
"description": "The lesson version that the user has completed"
"description": "The name of the lesson"
"description": "The length of the lesson in milliseconds"
"description": "Indicates if the lesson is a module or video lesson"
"description": "The thumbnail ID for the lesson"
"description": "The URI for the lesson thumbnail"
"description": "The date the trainee started the lesson"
"description": "The date the trainee finished the lesson"
"description": "The UserId of the user who completed the lesson"
"description": "The name of the user who completed the lesson"
"description": "An array of the reminders sent to a trainee"
"description": "An array of the question results, includes questions and answers"
"description": "The number of questions"
"description": "The ID of the type of questionnaire"
"description": "The trainees first name"
"description": "The trainees last name"
"description": "The user name of the trainee"
"description": "The employee number of the trainee"
"description": "An array of the groups the trainee belongs to"
"description": "An array of the supervisors for this user or group"
"description": "The ID of the published status for a lesson"
"description": "The ID of the method used to complete the lesson schedule"
"description": "The type ID of the lesson schedule method"
"description": "The minimum pass rate of a test"
"description": "The current position of the trainee through the lesson in milliseconds"
"description": "Shows if the trainee has received an email with the scheduled lesson linked"
"description": "Shows if the trainee received an overdue email reminder"
"description": "The movie URI location"
"description": "The movie file size in bytes"
"description": "The number of chapters in the lesson"
"description": "The id of the lesson schedule"
"description": "The date the lesson schedule was created"
"description": "The date the lesson schedule was last modified"
Called to retrieve a lesson schedule by unique Id. The lesson schedule unique identifier. Called for a list of users lesson schedules. The status of the lesson schedules to return. "description": "(Optional) the date to schedule a user to start a lesson. By default it is NOW(). the user will not be able to watch the lesson untl after the scheduleDate"
"description": "(Optional) The time period in which the user has to complete the lesson. If defined, gracePeriodUnit is requred. Default is the default grace period for the account - configurable in global settings"
"description": "The grace period unit. Possible values are `days` and `months`"
ILT Sessions contain information about the start and end time of a ILT Lesson session, the number of attendees, location and other attributes. Status This is an id to indicate the ILT Session’s active status. "description": "The result of ilt sessions." The lesson schedule related to the ILT Session. The id for the state of the ILT Session. The id for the status of the ILT Session. The user id for the instructor of the ILT Session. "description": "The instructor id for the session." "description": "The id for the status of the ILT Session." "description": "The lesson id that is related to this session." "description": "The name of the lesson related to this session." "description": "The boolean for a lesson being an instructor led lesson." "description": "Text for any notes attached." "description": "The number of attendees for the session." "description": "The capacity of possible session attendees." "description": "The start datetime of the session." "description": "The finish datetime of the session." "description": "The string for the location of the sesssion." "description": "The string for the state of the session." "description": "The percentage of attendence for the session." "description": "The percentage pass rate of attendees for the session." "description": "The boolean switch for notifications on session cancellation sent to trainees." "description": "The boolean switch for notifications on session cancellation sent to the instructor." "description": "The created datetime of the session." "description": "The last modified datetime of the session." "description": "The lesson id that is related to this session"
"description": "The user id for the instructor of the session." "description": "The first name of the instructor for the session." "description": "The last name of the instructor for the session." Complete an ilt session. This endpoint will complete all lesson schedules related to it as well as update the session itself. "description": "The userIds to register to this session." Bulk register an ilt session. Bulk deregister users for an ilt session. "description": "The list of attendees for an ilt session"
"description": "The boolean for an attendee passing the session." "description": "The boolean for an attendee attending the session." "description": "The full url for use in the iframe embed code"
"error": "Lesson Schedule does not exist"
"error": "This lesson schedule is completed"
"error": "This lesson schedule is cancelled"